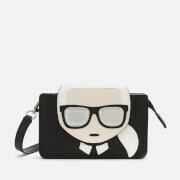 Black saffiano leather ‘K/Klassik’ mini cross-body bag from Karl Lagerfeld. Crafted from finely crosshatched textured leather, the cross-body bag is constructed with a fold-over front that is fastened by a snap button magnetic closure, opening to reveal two fully lined and generously sized compartments with a slip pocket. A removable and adjustable shoulder strap ensures comfortable carrying and the ‘K/Klassik’ mini cross-body bag is complete with tonal stitching and signature Karl Lagerfeld plaque branding to the front. – L.R. Dimensions: H: 10 x W: 18 x D: 7cm.